Last week, several of the “regular” bear-makers gathered at the Main Street Sewing Studio in Hampstead, NH, to sew Jayme’s Bears. As I looked around at the faces of our BEARY special friends, tears came to my eyes. There isn’t a day that goes by that I don’t reflect on the contributions of JFSJ’s volunteers and very generous friends. Today, Jayme would have celebrated her 30th birthday. After that sewing session, we counted the completed bears and discovered that we had sewn 29 bears! But wait, I had brought an already completed bear with me for no reason and pulled it out of my bag… and that made 30! I’m always delighted by the signs and surprises that let us know that Jayme is here with us, guiding JFSJ’s mission and reminding us to continue this important work. 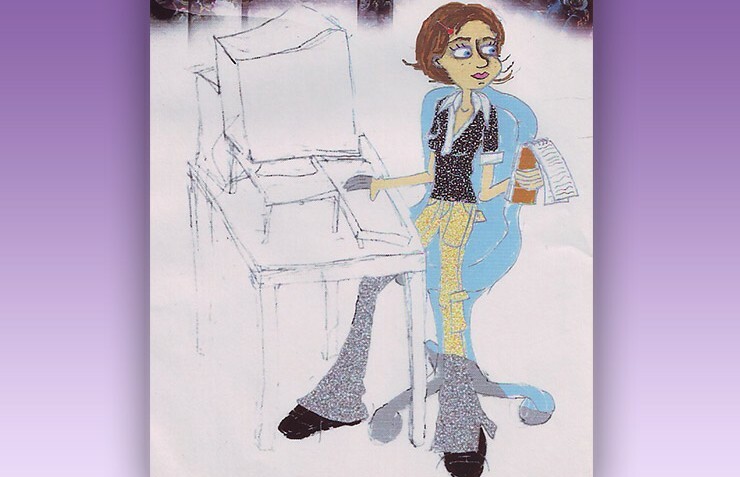 Here’s a picture that Jayme drew of herself working at the Derry News. Using her natural intellectual and creative skills, she was always on task, trying make the world a better place for all of us. I can’t believe that nearly 12 years of JFSJ have flown by! When I look back at all that we’ve accomplished and the friends made along the way, I couldn’t be more grateful. The evolution of our work and the support we receive, motivates me to make the years to come equally — if not more — impressive. More than a year ago, I knew that the website needed to better reflect what JFSJ has become since its start, and I wanted your experience of our online home to be both informative and inspiring. The JFSJ family is very grateful for the services of web designer, Heeral Desai of DreamCurves, and copywriter and social media strategist, Nisha Kumar Kulkarni, for their hard work and dedication. I hope you love the new, more interactive format, which allows for easier navigation and improved ability to stay in touch. Letting go of the old website was a long journey, but a necessary one. I’ll admit that it was hard to let go of the old website because it felt like I was letting go of a time closer to when Jayme was here. With this new web design though, I hope that we’ve succeeded in maintaining the passion, values and energy of Jayme, as well as that of the supportive community that has grown with JFSJ. I believe that Jayme would appreciate all the little details we’ve mulled over to complement all the work the JFSJ community has been doing so far. Alongside this website redesign is a renewed commitment to online communications. With social media and this blog, I want you to tell us your stories as you carry on our important work, just as we’ll share all our new developments with you. Whether it’s creating Jayme’s Bears, attending fundraising events, making donations and in-kind gifts, participating on our advisory board or the many other ways that you contribute, you truly are making a difference. The mission of the Fund couldn’t be accomplished without the support of our donors and volunteers. And, always, through each act of generosity and kindness, I am reminded of Jayme. Your actions keep Jayme’s spirit alive, and for that, I am deeply grateful. Please visit the blog often, and stay in touch via social media and email with your stories and feedback. It certainly wasn’t planned to launch the new website on Jayme’s 30th birthday, but like so many things that happen here at Jayme’s Fund, there is no doubt that Jayme is along side us, supporting and guiding the Fund’s mission. Stop by JFSJ’s Facebook page or follow us on Twitter and let us know what you think social justice is. We encourage you to talk, engage in lively debate and learn from one another.